BitcoinSwap.Online is the latest Bitcoin generating operation that claims to enable crypto investors the ability to accrue up to 1 BTC every few minutes. Relying upon exploits injected into Bitcoin mining pools and blockchain technology, Bitcoin Swap Online masquerades their platform as one that allows users to harvest as many bitcoins as they desire. Embodying the same website template as the Limited Bitcoin Generator scam we exposed, it goes without question that these two operations are intertwined and associated with one another. Bitcoin Swap Online is the spitting image of the Limited Bitcoin Generator scam. The con-artists behind this operation didn’t bother to make any alterations to the appearance of the site besides an increased time frame and a few other lines of text. Operating under the same capacity as the Limited Bitcoin Generator, investors believe they are exploiting Bitcoin mining pools and blockchain technology. As you can gather for yourself though, this operation functions in exactly the same manner. While it appears that your exploited bitcoins are just waiting to be redeemed, Bitcoin Swap Online requires a small Bitcoin payment to cover their miners fee. 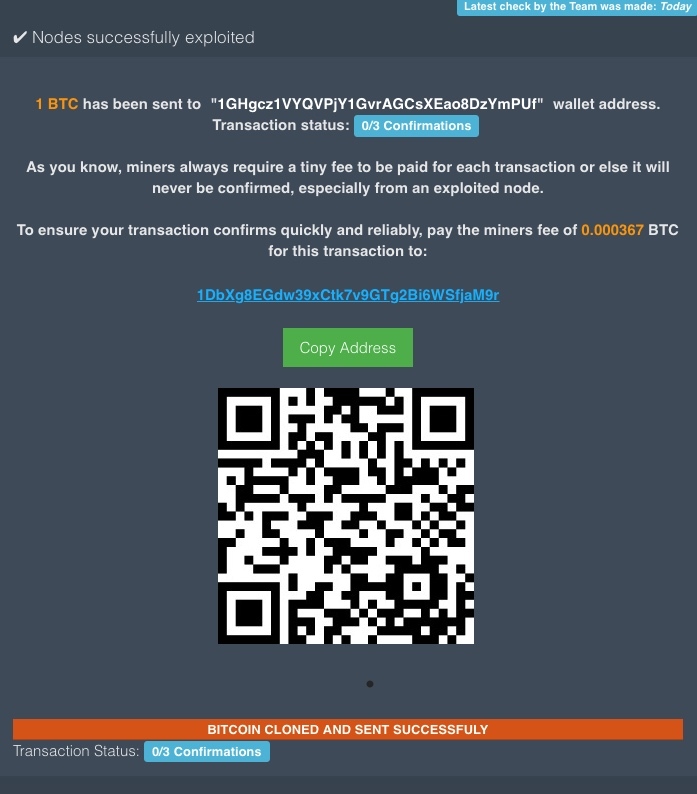 A fee of 0.000367 BTC is required to “pay their miners” which seems like a reasonable request considering that you can receive 0.1 to 1 Bitcoin in exchange. This is where the deception comes into play. Due to the nature of Bitcoin transactions, they are irreversible through their decentralized platform which is exactly what these con-artists are relying upon. While this is common knowledge among most crypto enthusiasts it is oftentimes a forgotten truth in the Bitcoin community. What you should really be asking yourself before you commit to pay their miners fee would be why they just can’t take the Bitcoin they exploited for you and use part of it to cover the miners fee? The answer is quite obvious really, which is that there aren’t any bitcoins being exploited through their site. A simple search through BlockChain will confirm that the vast sum of transactions occurring through their appropriated bitcoin address is incoming. To date, their Bitcoin wallet address of “1DbXg8EGdw39xCtk7v9GTg2Bi6WSfjaM9r” has shown that the last dozen or so transactions associated with their bitcoin wallet would be solely incoming transactions. A total of 37 transactions has occurred and has resulted in nearly 0.01 BTC to be allotted in theft. Yes! If you take into the consideration the 1 hour time frame backed by being able to generate 1 BTC in exploits every few minutes, essentially this site is claiming it can allow you to amass over 20 bitcoins in only 1 hour. During the time of writing this review, those 20 bitcoins equate to a value of over $300,000. It is hard to deny the true motive employed by the scammers behind Bitcoin Swap Online. Similar to Limited Bitcoin Generator, no identifying information can be found anywhere on the site. In essence, BitcoinSwap.Online is a completely anonymous service. This site provides a little bit more information regarding their operational model than their linked predecessor. 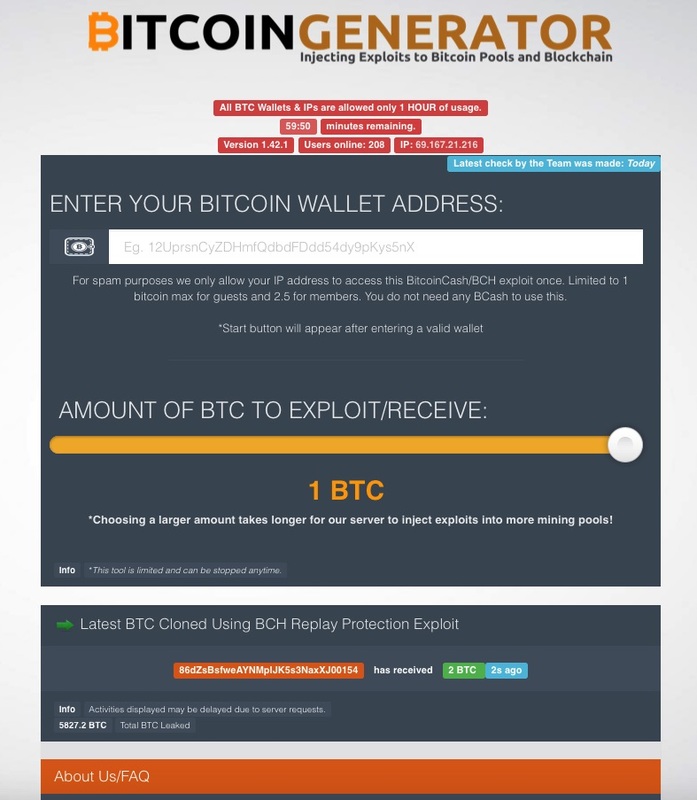 Claiming to have found a security flaw within the new BCC/BCH protocol released on November 12th, 2017 apparently this site is able to exploit bitcoins through that channel. It should also be noted that the “live chat” interface featured at the bottom of the site is not real and relays a scripted dialogue that reoccurs about every 7 to 8 minutes. A WHOIS report will reveal that this operation is fairly new and was created on October 31st, 2017. Created just nearly 4 months after the inception of Limited-Bitcoin-Generator.com, it appears that the creators are continuing this string of illicit Bitcoin exploiting schemes. No legitimate sites have shown any connection with BitcoinSwap.Online. BitcoinSwap.Online is an unpopular destination that receives virtually no traffic, only minor amounts here and there. Reflecting a SimilarWeb global rank of 36,397,527 as of December 2017, we can only hope that this operation will continue to remain unpopular. Nothing exhibited at Bitcoin Swap Online is legitimate. It is clear to us that the sole motive of these con-artists would be to slowly line their pockets through your deception and gullibility. If you come across any other operations similar to Bitcoin Swap Online, we encourage you to report them to ScamBitcoin.com so that we can further investigate into their legitimacy and origins. Review Verdict: Bitcoin Swap Online is a SCAM! Finding a reliable Bitcoin investment venture is more difficult than it appears due to the vast volume of scams circulating the cryptocurrency domain. If you are looking for practical and verified investment opportunities within the crypto world, we encourage you to visit our Cryptocurrency Investment Guide. Please share any thoughts, experiences or feedback you may have by leaving a comment below.